Detailed 4K images with a natural feeling of depth. Available in a wide range of sizes, these displays meet a variety of needs. It provides storefront signage that faithfully relays textures, and displays complicated drawings with high precision, making it excellent for office use. It is also equipped with a wide variety of connection terminals and built-in speakers, enabling use as a monitor for video conferences. The stylish and slim design complies with the ADA standard (a depth of less than 4-inch (approx.100mm) with brackets) in all important aspects. The narrow bezel displays higher-impact images, further enhancing the 4K picture quality. The slim profile isn't the least oppressive even when installed in a hanging configuration. * ADA stands for the "Americans with Disabilities Act," a United States law made to protect people with disabilities from discrimination. 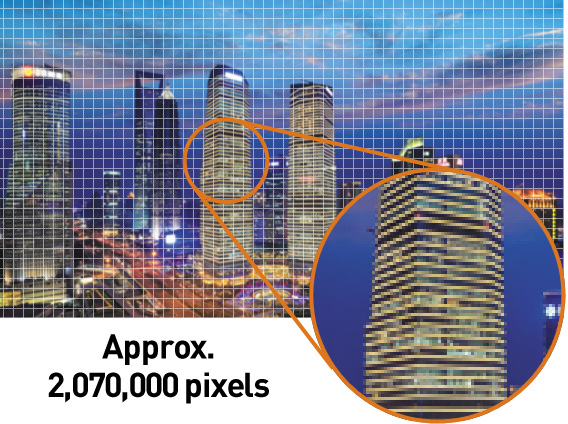 With approximately 8,290,000 pixels, about four times the pixels of a Full-HD display, images are highly detailed. This dynamic, large-screen display archives true-to-life finely nuanced images. 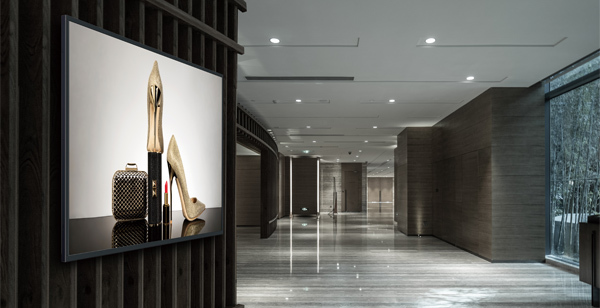 With an optimal viewing distance of 1.5 times the screen height, the 4K display is an excellent choice for digital signage and meeting rooms. Please visit "Why 4K" site. The EQ1 Series detects the signal when the display and PC are connected with a video cable, and activates the following chain of operations: display power ON → input switched → display power OFF. Without requiring remote control operation, a presenter can smoothly switch the PC screen, and there are no concerns about forgetting to turn off the power when the meeting ends. * Compatible terminals are HDMI1/HDMI2/DVI-D/PC. The Power Management of the display itself must be set in advance. * Effective terminals depend on menu settings. HDMI-CEC compatible devices can be connected to the display by an HDMI cable, enabling the basic operations (such as power ON/OFF), of the compatible devices to be controlled by the display's remote control. The display unit has built-in speakers so that it can playback content with sound without the connection of external speakers. This allows maximum use of a limited space for the installation of a large-screen display.